Ponzi schemes and pyramid schemes have been around for a long time. The Ponzi scheme is named after Charles Ponzi, who scammed people out of a lot of money in a fraudulent investment scheme in the 1920’s. Pyramid schemes and Ponzi schemes are often thought to be the same thing, although there are differences that will be explained in this article. Almost everyone will be exposed to Ponzi and pyramid schemes at some point. Often, the people that participate do not realize they are engaging in illegal activity, as some scams are presented as innocent games or gift exchanges. At the high end of town, these scams have cost investors millions of dollars. In other situations, people with very little have been fooled into investing grocery money as promises of big returns are made. Ponzi schemes and pyramid schemes are often thought to be different names for the same type of scam, but that isn’t so. 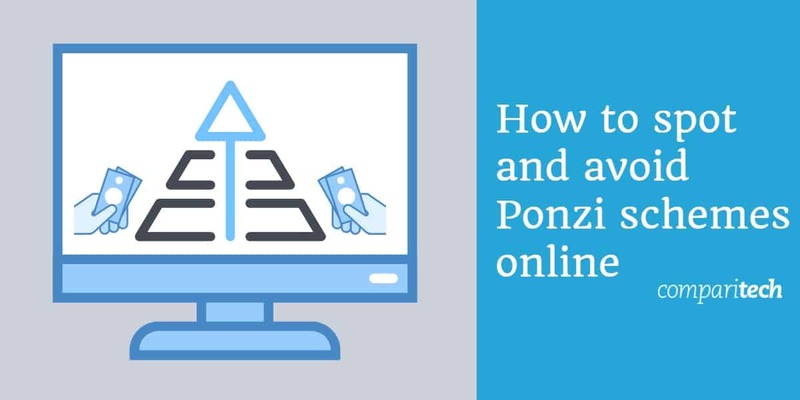 Ponzi schemes focus specifically on creating false investment opportunities that offer high returns with low risk profiles. As the investments do not exist, returns are funded by new investor payments. In reality, the scammer pockets most of the money. The success of schemes like these rely on two strategies. The first is the continuing deception of honest investors, including petitions for further capital investments, using fraudulent documentation that indicate the success of the investment. The second strategy requires the continuous sourcing of new investors to fund any requests to liquidate (in order to present an authentic front, payout requests are often met, although they are strongly discouraged). In a recent case, a scammer was jailed for fleecing up to 150 investors of $85 million. 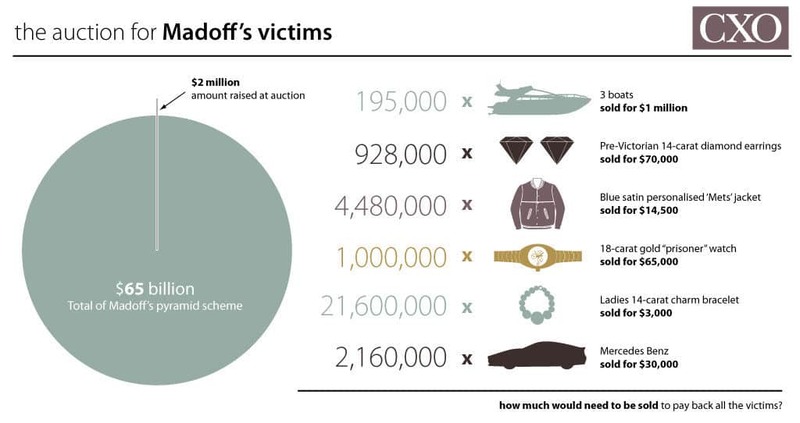 Ponzi schemes made headlines in the early 2000’s when Bernie Madoff was famously jailed for 150 years after defrauding investors of over $65 billion. Pyramid schemes are often referred to as Ponzi schemes, but they are slightly different. Both types of scam rely on victims investing money with the expectation of receiving large sums in return. Pyramid schemes operate by offering victims the chance to invest a fixed amount of money, and in return receive a much larger sum. Instead of the promised riches being made through passive investment, the victim must find other people to invite into the scheme, so the larger sum can be earned. The scam earns its name thanks to the ever-increasing layers of people who are recruited into the scam, so that the money is funneled upward to a few people at the top of the pyramid. One of the oldest types of pyramid scheme is the chain letter. A letter explains that you should send a postcard, money or a gift to the person listed at the top of the letter. The top name should be removed from the list and your name added to the bottom, then copies of the letter should be sent to 5 or 10 new people. As the letter passes from person to person, your name will make it to the top of the list and you’ll be inundated with money or gifts. This style of letter still exists, having transitioned first to fax, then email and now to social media messenger platforms. Another common type of pyramid scheme focuses on creating formal payment hierarchies. Each person involved is responsible for finding two other people underneath them to pay into the plan. When the tree has four layers and the original person has 14 underneath them, the money is passed up to the ‘captain’ and they cash out of the scheme. The two ‘co-pilots’ then become the top of two new investor trees or chains and must find more people to pay in so they can become captains and reap their reward. Some of these pyramid schemes can sound tempting in the first instance. Social media schemes are often disguised as ‘women supporting women’ or book exchanges, they seem innocuous or a bit of fun. They are illegal because there is no possible way every person who participates can access the promised reward. Ultimately the earth’s population is finite, and the last layers of people who participate cannot recruit anyone else. The amount of people that lose money on these schemes are always far greater than those who make money, which is why they are illegal. Cryptocurrency trading is a highly unregulated industry, making it an easy area for scammers to operate in. 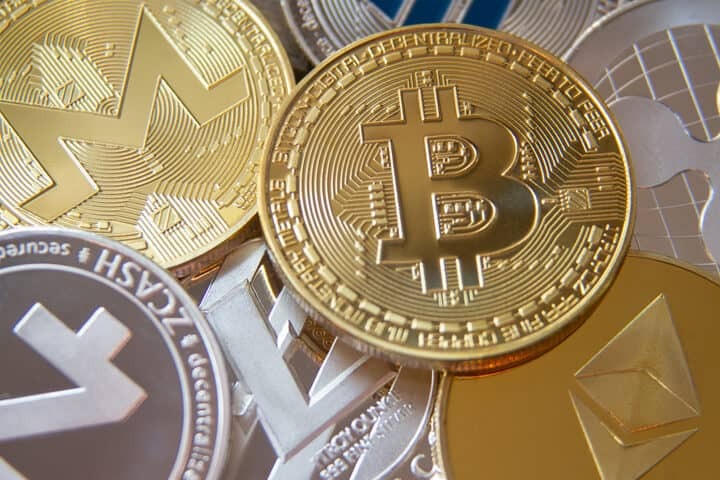 The alternative currencies are being used to transact Ponzi schemes, with unsuspecting victims being encouraged to buy in with promises of unrealistic returns and rewards for recruiting others. One recent case in Japan saw $68 million swindled from victims. Cryptocurrencies have been used to manipulate victims in other, related schemes, too. Pump-and-dump schemes have history within traditional stock trading environments but scammers have applied this method to cryptocurrencies, too. New currencies, or coins, are heavily promoted or ‘pumped’, causing many people to buy in and drive the price upward. When the desired price is reached, the scammers then ‘dump’ the coin, cash out the profits into fiat currency and leave the hopeful investors with worthless digital coins. A similar scheme known as an exit scam works the same way, but often the coin is created with this pump-and-dump strategy as the sole purpose of the coin. Majority coin holders hype the coin and encourage price increases then sell – crashing the market and keeping the profits. A final cryptocurrency Ponzi-style scheme to watch for is the ICO scheme. An initial coin offering is essentially a call out for early investors to purchase a newly created cryptocurrency. These ICOs often raise substantial amounts of money in a short time. Because of the unregulated nature of the industry, there is no guarantee that investors will see any return on their investment. There have been cases where scammers have launched ICOs and then simply walked away with the invested money. One Vietnamese example promised a 48% return, plus 8% commission to investors that recruited others – a true Ponzi scheme in action that cost victims over $660 million. Multi-level marketing plans are sometimes referred to as pyramid schemes, although they are technically not considered to be so. MLMs, also known as party plans, rely on recruiting new members to sell products on behalf of the parent company. Commissions are paid up the chain in an identical fashion to traditional pyramid schemes, but as the income is generated from product sales rather than nebulous investments, they are legal. The FTC has some additional information about the legality of multi-level marketing plans. Watch out for social media posts that encourage gifting money in exchange for a larger sum to be received from future participants. These schemes may look like innocent gifting games but are in fact illegal pyramid schemes. 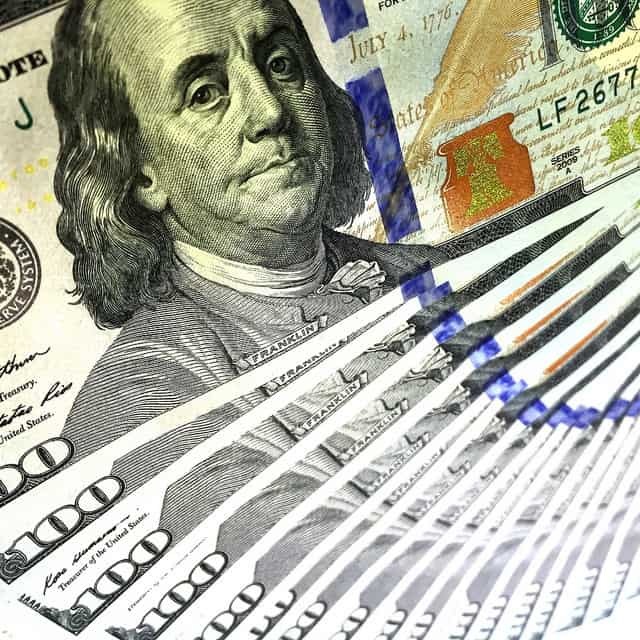 The Better Business Bureau reports that participating in the schemes is illegal and there is a very high chance that you will lose money if you participate. Some of these chain-mail style posts encourage sending money or books to the person on the top of the list, in the hope that eventually your name will be on top of the list, giving you the chance to receive many gifts. Social media networks that attract younger audiences are also being used to further new iterations of the captain’s hierarchy plan shown above. Young people contribute $150 to join using a popular payment app called Venmo, with the person at the top claiming $1200. It’s a fast-moving and attractive game for young people, who typically have poorer impulse control and may not be aware of the illegality of pyramid schemes. Some scammers take elements of both Ponzi schemes and pyramid schemes, blurring the lines between investment opportunities and recruitment plans. There are some key behaviors and phrases you should watch out for. There are also questions you can ask and things you can do to protect yourself from falling for a Ponzi scheme. Scammers create a high-pressure environment by making victims feel like they’ll miss out on a huge opportunity if they don’t act right away. This rushes victims into handing over money before they can think it through and see that it’s a scam. Take your time to consider any investment offer made and refuse to be pressured to act. Ponzi scheme investment scammers often succeed because they create a false sense of exclusivity. They pretend to offer the investment to limited, specially selected people. The secrecy and illusion of elitism also discourages victims from speaking about it to others, which further protects the scammers. Ask yourself if the offer is too good to be true. There is no such thing as a low risk investment with above average returns. Be wary if a person offers an investment plan that is out of step with general market behavior. Scammers use paid actors to offer false testimony of success with large-scale investment scams. Be watchful for any people who seem encouraging and supportive but are too pushy and forceful. Be aware that scammers may select actors that match your gender, religious affiliation or ethnicity in order to instill a sense of credibility. If the success of the ‘investment’ relies on you recruiting other people into the scheme, it’s probably an illegal pyramid scheme. This also stands if you are offered rewards for bringing others into the scheme. Honest investors will be up front about the details of the investment plan, including their compliance and legal requirements. If you’re asked to invest money with no information about financial management of investments, and they won’t disclose ‘proprietary trading information’, financial plan, or statements, it’s probably a scam. Pyramid schemes often ask you to send money online to a to a person you’ve never met. This is risky and almost always unrecoverable. This is especially true if a victim sends money by untraceable means like gift cards or wire transfers. Don’t do it. Scammers will discourage victims from seeking third party advice. If you are considering making an investment, you should conduct research to ensure it’s legitimate. Use independent sources not supplied by the people offering the investment. Be skeptical of every offer you receive. Emails, website addresses, caller ID displays – everything can be faked, imitated and ripped off. Be very wary of any offer that comes out of the blue. If your friend suddenly contacts you to offer an investment opportunity, their account may have been hacked by scammers. Verify by contacting them using a different channel. If you are considering investing significant amounts, conduct due diligence to investigate the trustworthiness of the company. The SEC website may be helpful. Is the investment insured or insurable? Before investing in anything, ask yourself if you can afford to lose the amount without suffering follow-on consequences. Report it to the Better Business Bureau Scam Tracker. Report it to the website that is hosting the message. For example, if you see the offer to join the scheme on Facebook, report the post as a scam using Facebook’s reporting mechanisms. Ignore it, delete it, and if you’re encouraged by your friends or family, don’t participate and encourage them not to. If you suspect you have been tricked into participating in a Ponzi investment scam or a pyramid scam, there are actions you can take to report the crime. You may not be able to get your money back but reporting the crime may help authorities track down and stop the scheme or warn others about the scam. Stop communicating with the scammers immediately. Do not send any more money or gifts. Report the suspected Ponzi scheme or pyramid scheme to the Securities and Exchange Commission. If the scam has occurred online, report it to the Internet Crime Complaint Center. If you think the scam originated outside the United States, report it to the agencies above and also to: ecommerce.gov. Use the Canadian Securities Administrators website to verify if the investment is registered and legal. Report investment fraud to the Financial and Consumer Services Commission. Collect as much information as you can to document your case. In the UK, investment fraud is being tackled with a campaign named, The Devil’s in Their Details. The effort is coordinated by ActionFraud, Financial Fraud Action UK, the Financial Conduct Authority and Get Safe Online.The Financial Conduct Authority has compiled a Warning List of problematic investments. You may like to verify any investment proposals against the list. Report Ponzi schemes and investment fraud to ActionFraud. The Australian Cybercrime Online Reporting Network (ACORN) should be contacted if the Ponzi scheme or pyramid scheme was conducted over the internet.Report any suspected Ponzi schemes to the Australian Securities and Investments Commission (ASIC). Australians can also report any instance of being scammed or being defrauded online at their local police station. Pyramid Scheme by Security and Exchange commission, U.S. Federal Govt. 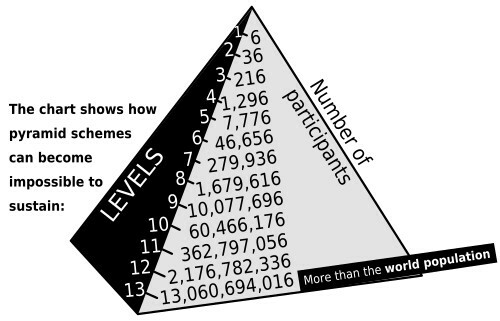 2 What is a pyramid scheme?